The product is a perfect methylation support for individuals lacking MTHFR gene mutation. 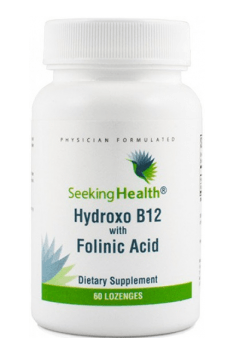 If we observe a considerable increase in blood vitamin B12 levels and no changes/increase in homocysteine levels, it is recommended to stop using the product and choose a supplement with methylcobalamin and folates. The product is also not recommended to women planning to have a child or in pregnancy. It is suggested to take folates in this case. Vitamin C supports immune response, the cardiovascular system and is essential for joints and other connective tissues. A set of four amino acids (lysine, proline, arginine, taurine) supporting of the cardiovascular system. Folinic acid - 5-formyltetrahydrofolate, a biologically active form of folic acid. Its supplementation is recommended especially to people with methylation dysfunctions, as it is essential for the transformation of folic acid to the active folate. Taking into consideration the increasing tendency to disorders in this respect, folates are more and more often recommended as the basic, preferred forms of supplementation with folic acid. Supplementation with these folates is especially recommended to women who are planning pregnancy or are pregnant. Folic acid in the biologically active form is responsible for regulating the formation of neural tube in the fetus and is conducive to its proper development. In adults, folates are conducive to optimal methylation processes. It takes part in transforming homocysteine to methionine, thanks to which it demonstrates positive influence on the health of the cardiovascular system. In this way, it positively influences psyche, as the effectiveness of this process is conducive to the production of S-adenosyl methionine with considerable influence on maintaining proper emotional states. Some sources also indicate the protective influence of folates on the development of cancers. This information, however, is not fully unambiguous. The present state of knowledge suggests that since the optimal supply of folates really decreases the risk of cancer development, its supplementation in excessively high doses may demonstrate the reverse effect.